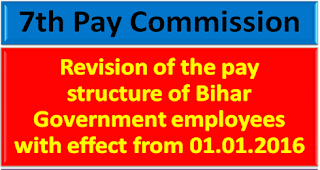 Revision of the pay structure of State Government employees with effect from 01.01.2016. 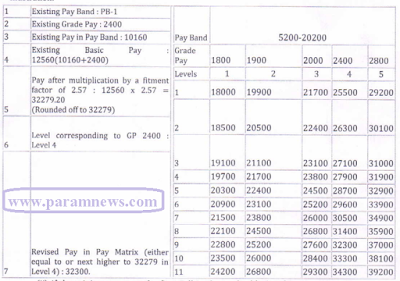 The revised pay structure shall come into effect notionally from 1st January, 2016. However, the actual payments in the revised pay structure would arise with effect from 1st April, 2017. The revised pay structure will apply to all State government employees who were in service on 1st, January, 2016 and to all new appointments made on or after the said date. 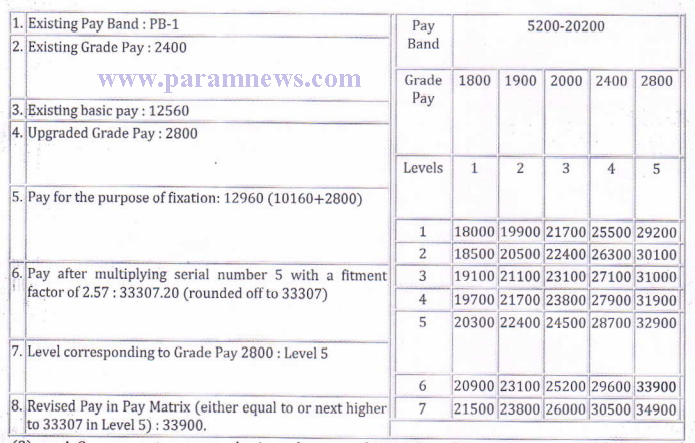 Patna: The Government of India has revised pay scales/pay structure on the recommendation of the 7th Central Pay Commission, with effect from 01.01.2016. The State Government vide its Resolution No. 9701 dated 22.12.2016, constituted a Pay Commission for recommending inter alia a revised pay structure for the State Government employees. In the light of the recommendations made by the 7th Cental Pay Commission for the revised pay structure for employees under the Central Government. On 15th May, 2017 the Pay Commission submitted its Report relating to pay scales and other benefits to the State Government employees. The State Government has given careful consideration to the recommendations of the Pay Commission, in respect of the State Government employees and have decided to accept the level based new revised pay structure, Schedule I contains the normal replacement revised pay level and Schedule II contains the pay matrix. 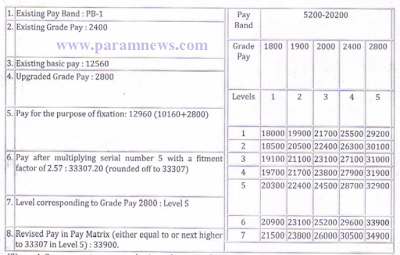 Department wise and post wise existing pay scales and revised scales of pay ofthe posts, under the State Government, arc at Schedule III. The revised pay structure shall come into effect notionally from 1st January, 2016. However, the actual payments in the revised pay structure would arise with effect from 1st April, 2017. The revised pay structure will apply to all State government employees who were in service on 1st, January, 2016 and to all new appointments made on or after the said date. In respect of the Government employees who were under suspension or on leave or were not on duty on 1st January 2016, the revised pay structure will be applicable from the date of return to duty and no arrears would be admissible for the period of absence. All other allowances shall continue to be payable at the same levels as before the pay revision. Thus, for example, if an employee was drawing Rs. 5000/- as HRA (House Rent Allowance) in the unrevised pay structure, then that employee shall continue to draw HRA at Rs. 5000/. The eligibility/scale/amount of travelling allowance shall be guided as per unrevised pay structure. The revised pay structure shall be sanctioned by the concerned Drawing and Disbursing Officer subject to the approval of the competent authority within a period of one year. "existing basic pay" means pay drawn in the prescribed existing scale of pay, including stagnation increment(s), but does not include any other type of pay like 'special pay' etc. "existing pay structure" in relation to a Government servant means the present system of Pay Band and grade Pay applicable to the post held by the Government servant as on the date immediately before the coming into force of these rules whether in substantive officiating capacity. Provided that a Government servant may elect to continue to draw pay in the existing pay structure until the date on which he earns his next or subsequent increment in the existing pay structure or until he vacates his post or ceases to draw pay in the existing pay structure. Provided further that in cases where a Government servant has been placed in a higher grade pay or scale between 1st day of January, 2016 and the date of notification of these rules on account of promotion or up gradation, the Government servant may elect to switch over to the revised pay structure from the date of such promotion or up gradation, as the case may be. The above option will have to be exercised by 31st July, 2017. (i) the pay in the applicable Level in the Pay Matt-ix shall be the pay obtained by multiplying the existing basic pay by a factor of 2.57 , rounded off to the nearest rupee and the figure so arrived at will be located in that Level in the Pay Matrix and if such an identical figure corresponds to any Cell in the applicable Level of the Pay Matrix, the same shall be the pay, and if no such Cell is available in the applicable Level, the pay shall be fixed at the immediate next higher Cell in that applicable Level of the Pay Matrix. 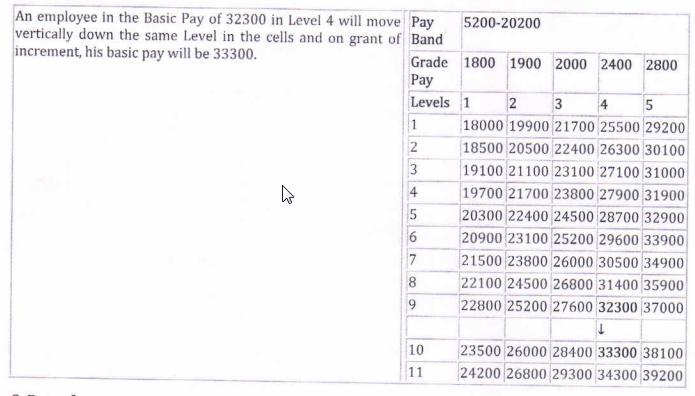 (ii) if the minimum pay or the first Cell in the applicable Level is more than the amount arrived at as per sub-clause (i) above, the pay shall be fixed at minimum pay or the first Cell of that the applicable Level. 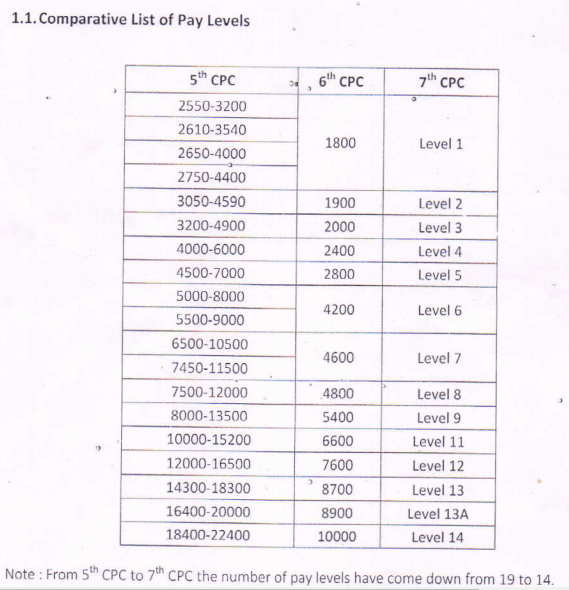 (2) Where a post has been upgraded as a result of the recommendations of the State pay Commission as indicated in Part B or Part C of the Schedule, the existing basic pay will be arrived at by adding the Pay drawn by the concerned employee in the existing Pay Band plus the Grade Pay corresponding to the Level to which the post has been upgraded and, the fixation of pay shall be done in the manner prescribed in accordance with clause (A) of sub-rule (1). (3) A Government servant who is on leave on the 1st day of January, 2016 and is entitled to leave salary shall be entitled to pay in the revised pay structure from 1st day of January 2016 or the date of option for the revised pay structure. (4) A government servant who is on study leave on the 1st day of January, 2016 shall be entitled to the pay in the revised pay structure from 1st day of January, 2016 or the date of option. (6) Where a Government servant holding a permanent post is officiating in a higher post on a regular basis and the pay structure applicable to these two posts are merged into one Level, the pay shall be fixed under sub-rule (1) with reference to the officiating post only and the pay so fixed shall be treated as substantive pay. (9) Where a Government servant is in receipt of personal pay immediately before the date of notification of these rules, which together with his existing emoluments exceed the revised emoluments, then the difference representing such excess shall be allowed to such Government servant as personal pay to be absorbed in future increase in pay. Provided that if the junior officer was drawing more pay in the existing pay structure than the senior by virtue of any advance increments granted to him, the provisions of this sub- rule shall not be invoked to step up the pay of the senior officer. (ii) The order relating to re-fixation of the pay of the senior officer in accordance with clause (i) shall be issued under Fundamental Rule 27 and the senior officer shall be entitled to the next increment on completion or of his required qualifying service with effect from the date of re-fixation of pay. (11) Subject to the provisions of rule 5, if the pay as fixed in the officiating post under sub-rule (i) is lower than the pay fixed in the substantive post, the former shall be fixed at the same stage as the substantive pay. 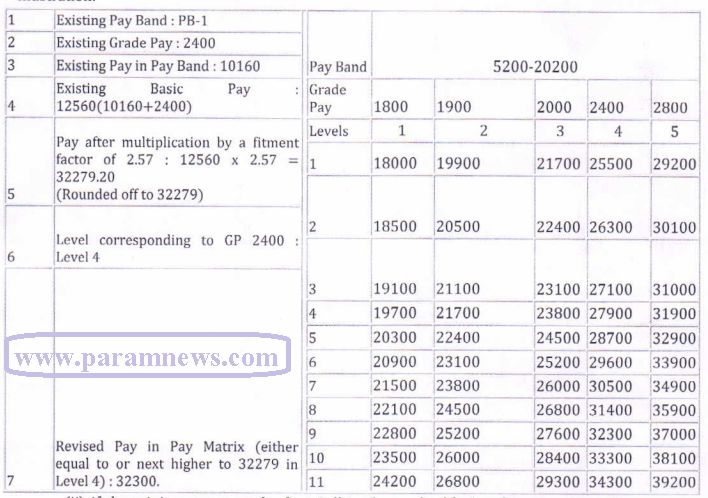 Fixation of pay of employees appointed by direct recruitment on or after 1st day of January, 2016. The pay of employees appointed by direct recruitment on or after 1st day of January, 2016 shall be fixed at the minimum pay or the first Cell in the Level, applicable to the post to which such employees are appointed. Provided that where the existing pay of such employee appointed on or after 1st day of January, 2016 and before the date of to notification of these rules, has already been fixed in the existing pay structure and if his existing emoluments happen to exceed the minimum pay or the first Cell in the Level, as applicable to the post to which he is appointed on or after 1st day of January, 20'16, such difference shall be paid as personal pay to be absorbed in future increments in pay. The increment shall be as specified in the vertical Cells of the Matrix. 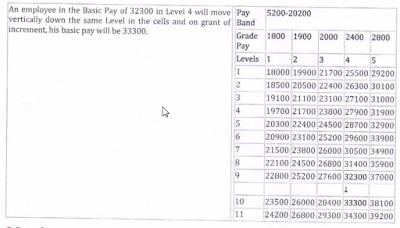 Date of next increment in revised pay structure. Provided that an employee shall be entitled to only one annual increment either on 1st January or 1st July depending on the date of his appointment, promotion or grant of financial up-gradation. (2) The increment in respect of an employee appointed or promoted or granted financial upgradation including upgradation under Modified Assured Career progression Scheme (MACpS) during the period between the 2nd day of January and 1st day of July (both inclusive) shall be granted on 1st day of January and the increment in respect of an employee appointed or promoted or granted financial upgradation including upgradation under MACpS during the period between the 2nd day ofJuly and 1st day of January (both inclusive) shall be granted on 1st day of July. (a) In case ofan employee appointed or promoted in the normal hierarchy or under MACPS during the period between the 2nd day of luly, 2016 and the 1st day of January, 2017, the first increment shall accrue on the 1st day of July, 2017 and thereafter it shall accrue after one year on annual basis. Provided further that the next increment after drawl of increment on 1st day of July, 2016 shall accrue on 1st day of July, 2017. Revision of pay from a date subsequent to 1st day of January, 2016. 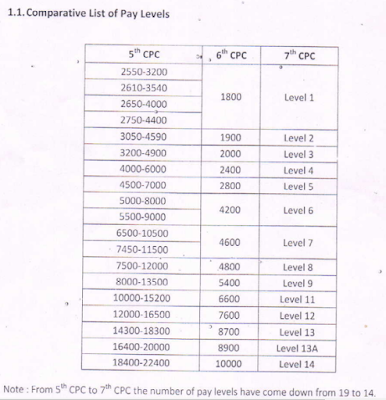 Where a Government servant who continues to draw his pay in the existing pay structure is brought over to the revised pay structure from a date later than 1st day of January, 2016, his pay in the revised pay structure shall be fixcd in thc manner prescribed in accordance with clause (A)of sub-rule (1) of rule 6. (D One increment shall be given in the Level from which the employee is promoted and he shall be placed at a Cell equal to the figure so arrived at in the Level of the post to which promoted and if no such cell is available in the Level to which promoted, he shall be placed at the next higher Cell in that Level. Mode of payment of arrears of pay. The arrears shall be paid during the Financial year 2017-2018. 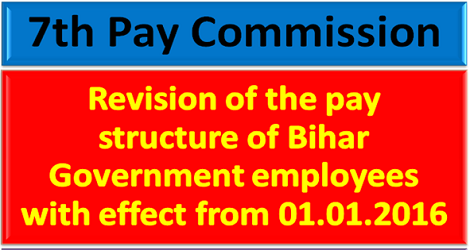 Revision of the pay structure of State Government employees with effect from 01.01.2016. The revised pay structure shall come into effect notionally from 1st January, 2016. 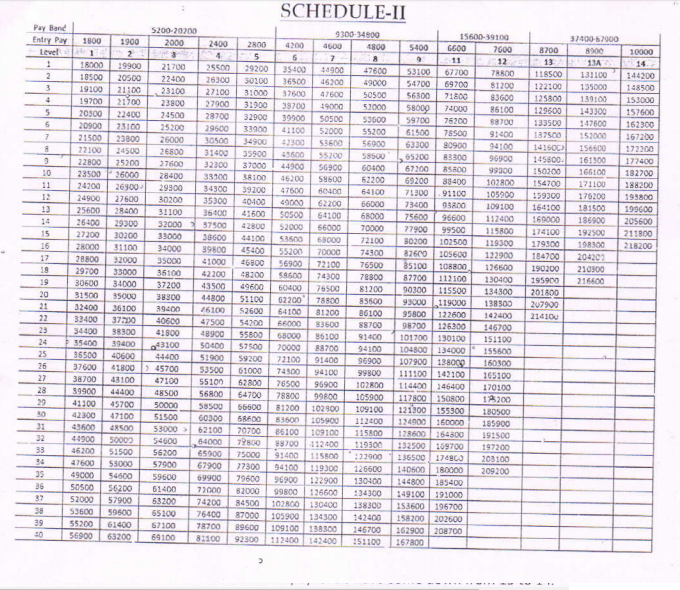 Drawl of Pay in the Revised Pay Structure, Fitment in case of Upgradation of post as per 7th CPC, Fixation of pay in the revised pay structure, Date of next increment in revised pay structure, Increments in Pay Matrix, Fixation of pay of employees appointed by direct recruitment on or after 1st day of January, 2016. Revision of pay from a date subsequent to 1st day of January, 2016. 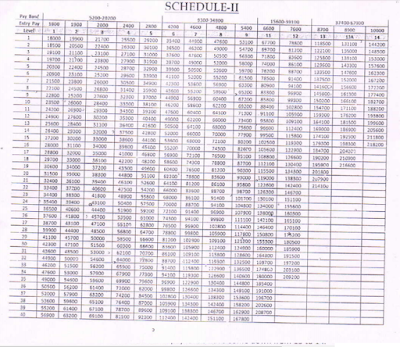 Fixation of pay on promotion on or after 1st day of January 2016, Mode of payment of arrears of pay.